ab55424 detects endogenous levels of total gamma Synuclein/SNCG protein. Synthetic peptide corresponding to Human gamma Synuclein/SNCG. human lung carcinoma tissue and HT29 cell extract. Our Abpromise guarantee covers the use of ab55424 in the following tested applications. WB 1/500 - 1/1000. Detects a band of approximately 13 kDa (predicted molecular weight: 13 kDa). 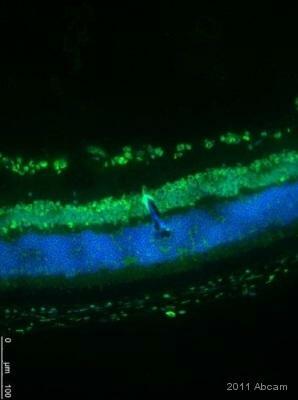 ab55424 staining gamma Synclein in Rat retina cells by ICC/IF (Immunocytochemistry/immunofluorescence). Cells were fixed with formaldehyde, permeabilized by freezing and blocked with 2% serum for 1 hour at 24°C. Samples were incubated with primary antibody (1/100 in 2% Triton + 2% Serum in PBS) for 8 hours at 4°C. 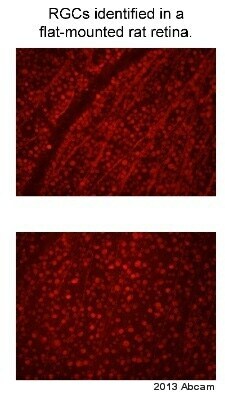 An Alexa Fluor® 594-conjugated Donkey anti-rabbit IgG polyclonal (1/500) was used as the secondary antibody. Immunohistochemical analysis of paraffin-embedded human lung carcinoma tissue using ab55424 (1/50 dilution), in the presence or absence of the immunizing peptide. 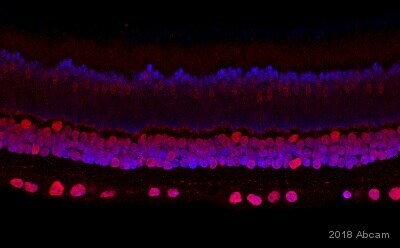 ab55424 staining gamma Synuclein/SNCG in Mouse retinal tissue sections by Immunohistochemistry (IHC-Fr - frozen sections). Tissue was fixed with paraformaldehyde and blocked with 5% serum for 1 hour at 25°C. Samples were incubated with primary antibody (1/100 in P) for 12 hours at 4°C. 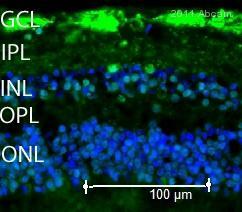 An Alexa Fluor®594-conjugated Donkey anti-rabbit polyclonal (1/1000) was used as the secondary antibody. Immunohistochemistry (Frozen sections) - Anti-gamma Synuclein/SNCG antibody (ab55424)Image courtesy of an anonymous Abreview. 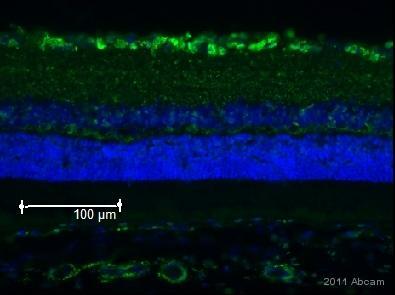 ab55424 staining gamma Synuclein/SNCG in murine retinal tissue by Immunohistochemistry (Frozen sections).Tissue was fixed in formaldehyde, blocked using 10% serum for 30 minutes at 24°C, then incubated with ab55424 at a 1/100 dilution for 16 hours at 4°C. The secondary used was an Alexa Fluor 488 conjugated goat anti-rabbit polyclonal used at a 1/1000 dilution. 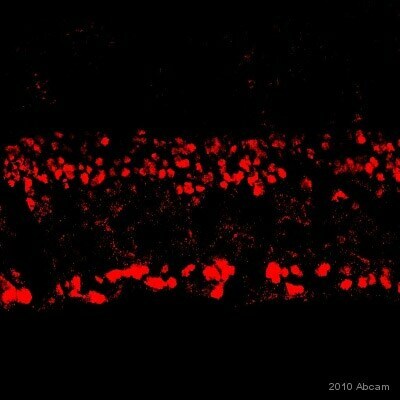 ab55424 staining gamma Synuclein/SNCG in rat retinal tissue by Immunohistochemistry (Frozen sections).Tissue was fixed in paraformaldehyde, blocked using 10% serum for 30 minutes at 24°C, then incubated with ab55424 at a 1/100 dilution for 16 hours at 4°C. 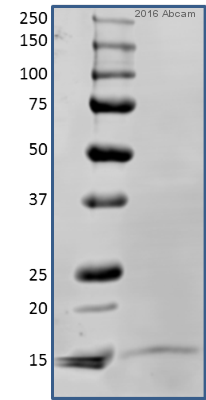 The secondary used was an Alexa Fluor 488 conjugated goat anti-rabbit polyclonal used at a 1/1000 dilution. Publishing research using ab55424? Please let us know so that we can cite the reference in this datasheet. My question is whether synthetic peptide for gamma synuclein antibody production was conjugated with BSA? I am talking about ab55424 antibody. I heard back from the lab that the synthetic peptide used for production of this antibody is conjugated with KLH.